You must be a member of the Leuven City Trotters Group to attend this activity. Would you like to join this group? Let's have some fun blasting away! Again!! This activity has always been a blast for everyone who came! 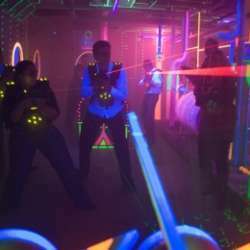 Now join us and expand our group as we play 3 short games of lasertag with different themes. The date and time are set. There needs to be a minimum of 6 or more people signing up. The sooner the better! $21 euros for 3 games per person. Please let me know if you are NOT coming BEFORE the day of the activity. We expect to have some awesome fun! Its possible that we will go for drinks after. See you there!